Ormiston Herman Academy – Pioneers ‘reading’ the way! Ormiston Herman Academy > News > Academy news > Pioneers ‘reading’ the way! An amazing 17 children from Pioneers class took the challenge and read 4 or more times at home this week. Earning themselves a certificate, a trip to the Golden Book and a prize from the treasure box. They even had Mrs Rutherford doing cartwheels!!! Not only that but they have now inspired other children in the school to aim to do the same. Wouldn’t it be amazing to have EVERYONE reading so often? 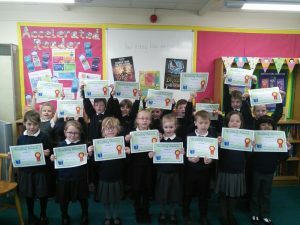 Well done boys and girls and a huge thank you to the grown ups at home for supporting them in their home reading.